The mystery of how Bruce Wayne became Batman, illustrated by Caldecott Honor artist Jon J. Muth! 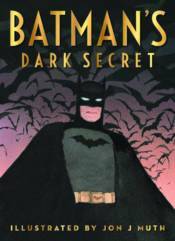 In advance of the new Batman vs. Superman movie coming out in March, here comes a larger, hardcover version of Batman's Dark Secret! The cover features a new illustration by Caldecott Honor winner Jon J. Muth! One day, a lonely orphan named Bruce Wayne finds himself in a dangerous situation. He defends himself against a monster bat - and wins. From that time on, he is determined to fight evil. He becomes Batman! Batman's Dark Secret is an inspiring story of how a young child overcame his fear of the dark and became a crime-fighting superhero.